Be kind to your CPU. Give it a good home. When Intel announced its 9th generation Core processors earlier this month, there was only one thought on everyone’s mind: will I need a new motherboard? That might be a bit of a generalization, but not a total stretch. The company's new Z390 chipset means a deluge of flashy new motherboards, which in turn means discounts on the older models—just in time for Cyber Monday. And let’s not forget that AMD released its 2nd gen Ryzen processors earlier this year, so expect to have your pick of the lot this holiday season. If you're thinking about upgrading your motherboard, now is a great time to make the switch. For Intel systems, we recommend Z390 and Z370 motherboards as the best option, though there are also some B360 boards that would be fine if you're not buying an unlocked K-series CPU. For AMD, X470 boards are at the top of the list, with B450, X370, and B350 options also being viable. If you're planning on a high performance build, we should see motherboards that normally cost $200 going for $150 or less, and we'll be updating this page throughout the next week or two with the best deals we can find. Something else to consider is that while Intel CPUs don't usually get discounted as much as AMD offerings, the same isn't true of motherboards. A good deal on an Intel motherboard could make up the difference in pricing between an AMD and Intel build. Of course AMD motherboards are also seeing some great deals as well. This isn't the fanciest board, but ASRock makes the least expensive Z390 board we've found so far. There's an additional $10 rebate, it supports DDR4-4300 RAM, has an M.2 slot, and should handle moderate overclocking. Buy at Newegg. Fancy a Z370 board for overclocking, for the lowest price we've seen? Combined with the $20 rebate card, this MSI motherboard is now $40 off the regular price. Buy at Newegg. The Z370 chipset may have been usurped by the Z390, but at this price this is still a great gaming option, particularly if you're sticking with 8th-gen processors. Buy at BestBuy. A $20 MIR drops the price of this mini-ITX board nearly 40 percent, and it's still packed with features like 802.11ac wifi. A great option if you're hoping to build a tiny media center PC. Buy at Newegg. If you're looking for a higher spec AMD board with the X470 chipset, this ASRock board is one of the better deals, currently 33 percent off after the $20 MIR. Buy at Newegg. One of last year's better X370 boards is now more than half off the original price, after the $30 MIR. This MSI board fully supports the newer Ryzen 2 processors, including APUs. The only thing it's missing is wifi. Buy at Newegg. This cheeky board from MSI supports AMD RYZEN series processors and 7th Gen A-series/Athlon processors so you can be sure your gaming machine is at its best. Buy at Amazon. It doesn't get much cheaper than this for an AMD Ryzen motherboard. This micro-ATX board still has an M.2 slot, but only two DIMM slots. There's a $10 MIR. Buy at Newegg. Not surprisingly, with the arrival of Z390 boards, the last gen offerings are seeing steep discounts. After the $25 MIR, this high-end ASRock board with SLI support costs just $100 and has everything you could want. Buy at Newegg. Great deal on a very good Asus X470 board with 'military' grade capacitors and chokes. Ooh, er! Buy at Amazon. A basic Intel motherboard for non-overclocking CPUs doesn't mean you have to opt for a B360 chipset. This Z370 board includes everything you need, as well as support for higher speed memory, for less than $100. Buy at Amazon. Better known for its graphics cards, EVGA also makes high-end Intel motherboards. The Z370 Classified K is the current high-end offering for Coffee Lake CPUs and includes support for SLI and overclocking, plus three M.2 slots (one Key-E only). Buy at Newegg. This ATX board normally sells for $175 or more and comes with all the bells and whistles. It's last year's model, but a BIOS update will let you run 9th Gen CPUs. Buy at Fry's. One of Amazon's deals of the day, this one will be over soon (or is already over, depending on when you're reading this). Buy on Amazon. If you're planning an AMD Ryzen build, MSI's X470 board impressed at launch, and it's priced attractively. You get dual M.2 slots, RGB lighting, and even HDMI and DP ports (if you want to use an APU). Buy at Fry's. For non-K CPUs and non-overclocking purposes, there's no need for the Z-series chipset. The H370 does just fine, and this MSI board is over 40 percent off after the $20 MIR. Note that RAM speed is limited to DDR4-2666. Buy at Newegg. If you're in the market for a powerful new motherboard, this Intel-friendly model from Gigabyte has been fine-tuned with gaming in mind. The Z390 boards are already stocked at online-retailers. They're not a total overhaul of the Z370s, but they've added a few extra features—specifically native USB 3.1 Gen2 support and faster 802.11ac Wave2 wifi. Most Z370 boards also have updated BIOSes to accommodate the new 9th gen Cores. If you are thinking on splurging on one of Intel's new CPUs, but need a new motherboard to go with it, you don't need to rush to get the newest one. Expect to see some of the same discounts again as last year. 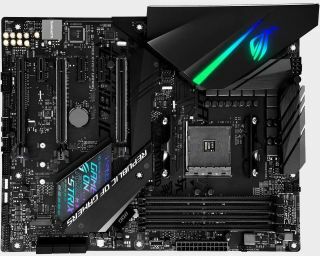 As for motherboards with AMD chipsets, there were a few deals last year on motherboards that supported both first gen and second gen Ryzen processors, like the ASUS ROG Strix X370-F, so it seems likely we'll see those deals again. We've seen a lot of great deals on AMD motherboards already. Of course, if you aren't sure what to put on your shopping list when the time comes, you can always take a look at our recommendations for the best gaming motherboards.